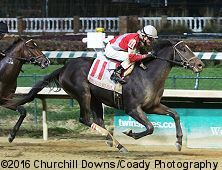 Note: McCraken was undefeated in 3 starts last year, all at Churchill Downs, including a win in the Kentucky Jockey Club (G2). He made his 2017 debut winning the Sam F. Davis Stakes (G3) at Tampa Bay Downs in track record time. Sent off as the 8-5 favorite in the Blue Grass Stakes (G2) he finished 3rd beaten 3 3/4 lengths. He finished 8th beaten 13 1/4 lengths in the Kentucky Derby (G1) at odds of 7-1.